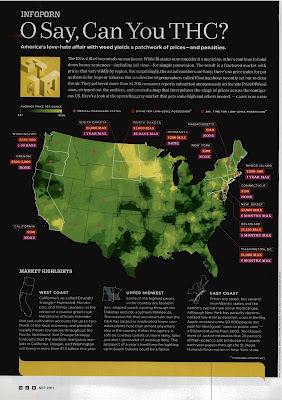 Following on from our "Price of Weed" maps featured in the September issue of Wired, we would like to make available the draft report that the maps came from. 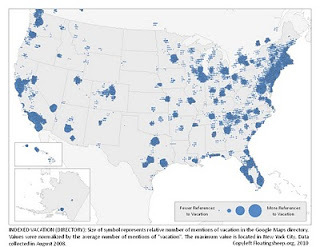 The full title of the paper is "Data Shadows of an Underground Economy: Volunteered Geographic Information and the Economic Geographies of Marijuana." Please note that we are still working on the paper (so excuse any lack of polish), but would certainly appreciate any comments and critiques on the draft before we submit it for peer-review. We’re very happy to report that a new FloatingSheep map is featured in the September issue of WIRED magazine under the title of "Infoporn: O Say, Can You THC?" . Our map shows the differences in the retail price of marijuana based on user generated reports from the PriceofWeed website. 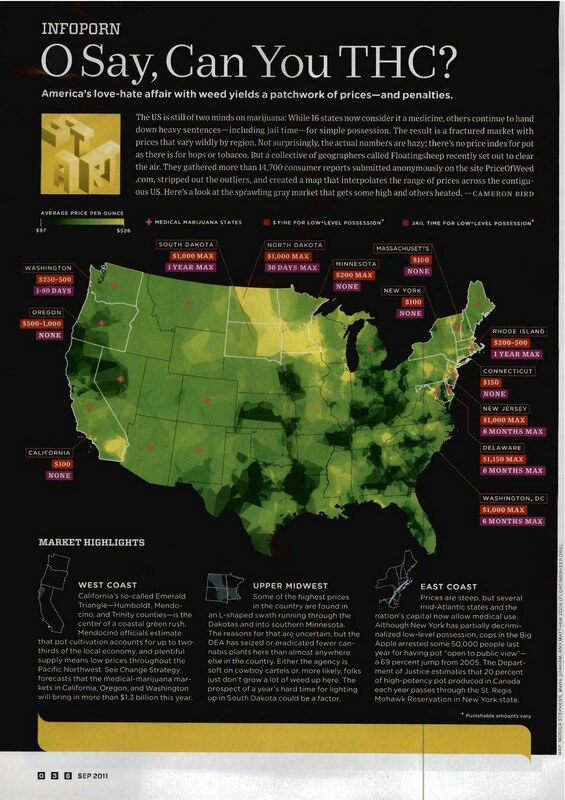 According to WIRED, it offers "a look at the sprawling gray market that gets some high and others heated." Green = lower prices; Yellow = higher prices. One of the things that jumps out clearly is the low prices associated with the marijuana production sites associated with Mendocino, Trinity and Humboldt County in California as well as Kentucky and Tennessee. See this National Drug Intelligence Center report on the distribution of marijuana production by state. 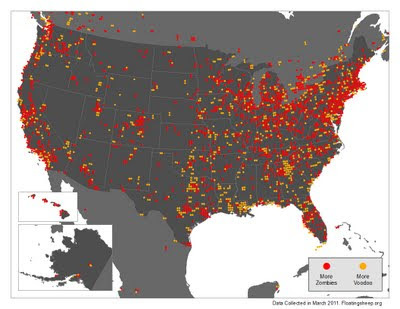 The map featured in WIRED is taken from a much more detailed research paper focused on the potential for user-generated data to shed light on underground economies such as marijuana use. 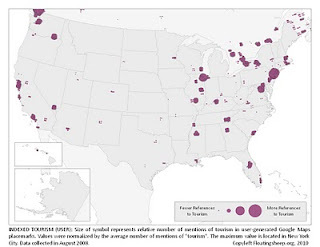 The map relies upon thousands of user reports on marijuana purchases referenced to city locations from the Priceofweed website (see our earlier posting). After cleaning the data to get rid of the outliers, we created a continuous surface using a statistical interpolation technique known as kriging to identify the average variance among price differences through a spherical semivariogram model. 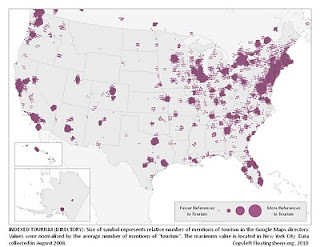 To obtain a price for each location show in the map above, an interpolated value was estimated as a weighted average of prices from its twelve neighboring points. One of the issues in generating these maps is how many observations we would require at each point (or city) before including it in interpolation. Increasing the number of observations (e.g., n > 10) helps control error in the average price at each point but limits the number of points. Lowering the sample size requirement (e.g., > 2) results in more points upon which to base the interpolation but increases price variance. In order to visualize these differences compare the map above (n > 2) with the map below (n > 10). While the first map shows a finer resolution of price variation (albeit with a decrease in the accuracy of the pricing data) it is consistent with the patterns resulting from the rougher resolution in the second map. We’re in the process of finalizing a paper analyzing this data including a state and city-level multivariate analysis of price. Key explanatory variables in the models include the legality of medical marijuana, level of production and an intriguing distance decay effect as one moves away from Northern California. You can download the draft paper at this link. As always we welcome questions and critiques. You know that someone had a lot of fun coming up with this title. August is the season for summer vacations and things are no different here at Floating Sheep. The collective has been taking it easy this month but we're gearing up for the Fall mapping season. This includes some detailed analysis and maps of crowd sourced data on the geography of the underground economy of marijuana. Stay tuned! 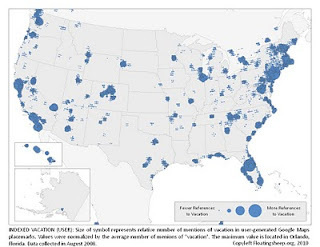 Until then we thought it worthwhile to revisit our analysis of the Geography of Vacation which we first posted back in February 2010. We take solace in the fact that there is this nifty new technology called the "intertubes" that allows people to exchange information across great distance . It sounds very intriguing and we looked forward to powering up our 1200 baud modem so we can try it out. We expect this will ensure that Taylor's cutting and pithy commentary will continue to grace these pages. So even as Taylor's physical residence shifts, Floating Sheep will remain his digital hangout...his virtual pasture in the tubes. 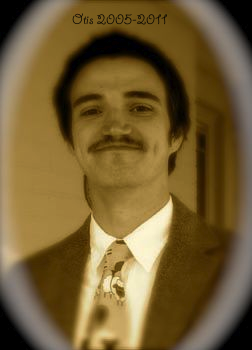 We also take solace in the fact that we have such a jazzy picture of him to share with the world. Please note the tie...available for purchase at our gift shop. After seven parts of this series, we remain somewhat surprised about the sheer amount of things we had to say about zombies. After all, zombies themselves are remarkably reticent when it comes to revealing their inner thoughts. Then again, how much is there to say about "braaaaiiiinnnnnsssssss"? In any case, given the strict word length for our chapter we found that plenty of material ended up on the cutting room floor. Since we were all raised to be thrifty, we're recycling it here. The two maps in this post turn our attention to the importance of voodoo to zombie culture. Of course, the idea of the "zombi" as living dead derives primarily from the practice of voodoo as it was transmitted from Africa to Haiti, making the practice of voodoo spirituality almost inseparable from the modern cult of the undead. 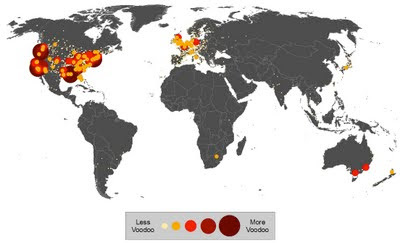 In the first map above, it is rather hard to see any clear patterns of references to "voodoo" at the global scale that cannot be seen in the U.S. map as well. On the other hand, the second map of the U.S. does show some intriguing clusters. First is the clear preference towards voodoo in Louisiana and much of the gulf coast, almost certainly reflecting the historical and cultural practice of the voodoo religion in the region. Harder to explain are the clusters around Dallas and Atlanta which, to our knowledge, don't have the same cultural traditions. Of course, the fact that the Northeast from DC to Boston is nothing but a seething pit of zombies comes as little surprise. Be sure to check out the previous iterations of our Preparing for the Zombie Apocalypse series in Parts I, II, III, IV, V, VI and VII.